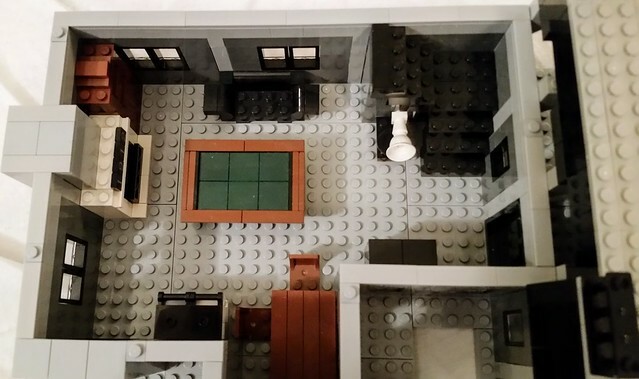 The house was originally made in 2007 as a digital construct by Brickshelf user "Widdi" and was found by me at this address back in late 2014. 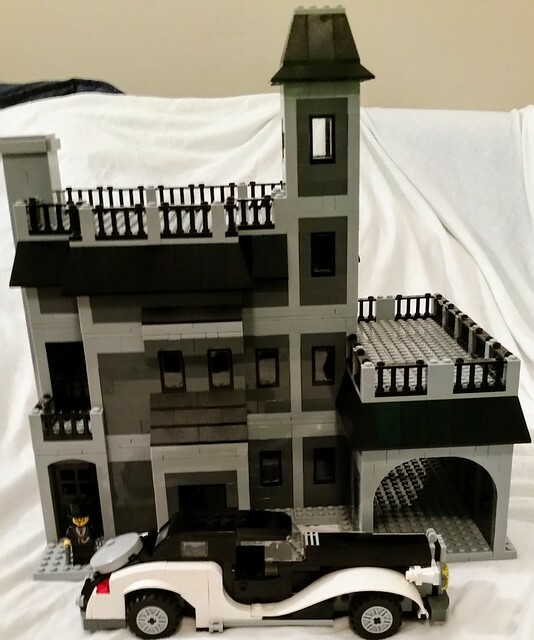 I then changed the color, added a garage and a back half to the building, and eventually put in a chimney styled after the one in set 10228. 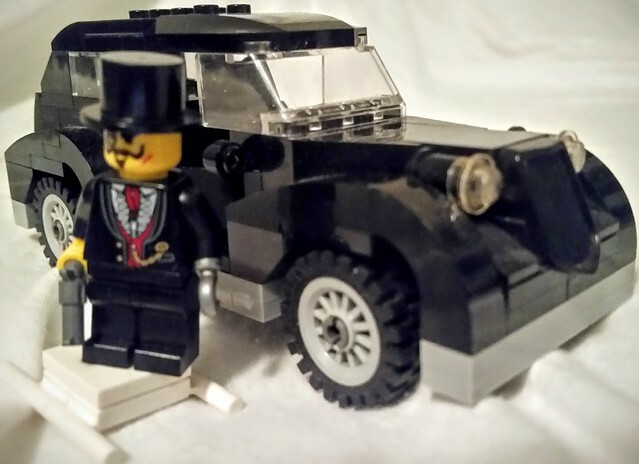 The car on the other hand was inspired by this build which was in turn a modified version of set 70911, (Arctic Roller) This model is Sam Sinister's largest ride to date and lacks the spring loaded shooters of the original set. I replaced them with a proper car grille. The garage to the side of the building is unusual, as Victorian houses never had them. Thus, I've decided it was a later addition in 1918 by Sam Sinister when he inherited the house from his father, just after Sam returned from World War I. The rear of the building features a large amount of windows, while the far side has a stone chimney flue. 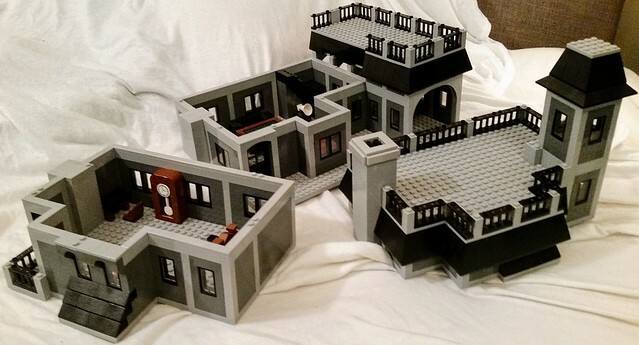 The second floor features the master bedroom / writing room with a small balcony on the right hand side. 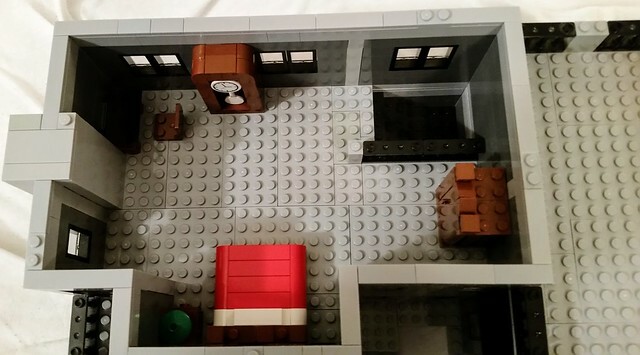 The furniture on the upper floor features a bed, a desk, table with lamp, a cabinet, and a grandfather clock. The ground floor is little crowded with the kitchen and living room appliances / furniture. The items seen here includes a stove, wine cabinet, table with two chairs, phonograph, couch, curio cabinet, and pool table. The sign above the fireplace is supposed to read "1912" for that is the year the house was built. The building is modular, so the roof top, second floor, and ground floor all come apart from each other. 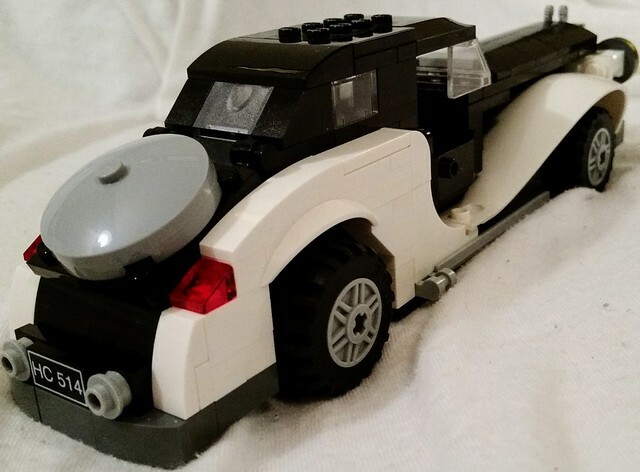 The car by itself is about 8 studs wide (with a tiny 1/2 stud bit of overhang on each side due to the front wheel wells) and 28 studs long in total. 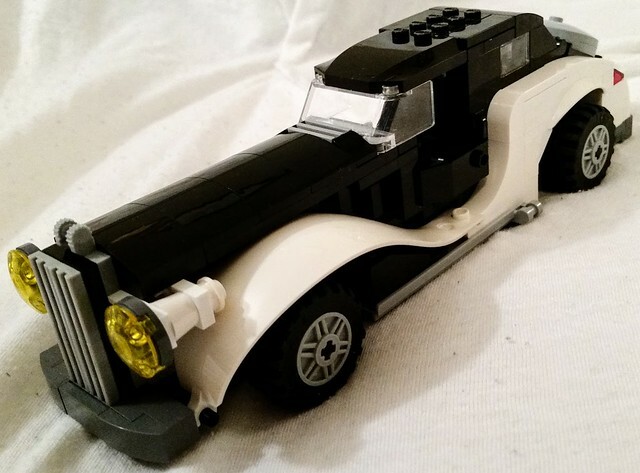 As a side note, the headlights are not clipped in the same way as the original set had, and are instead sandwiched in place with 1 x 6 plates sand headlight bricks. The rear of the car features a license plate for Lord Sam Sinister and dual exhaust. The gray round thing on the trunk is supposed to house a spare tire, but it doesn't.... it's really just for looks. Two figures (sans tall hats) can fit side-by-side in the car, and their is space in the opening trunk for a briefcase. The teeny tiny mini-figure out by the front door of the house is Lord Sam Sinister... it just gives you an idea how massive the house and car really are! Built in 1912, Sinister Manor is one of the last houses built in the Victorian Style of architecture in Ironwood county. 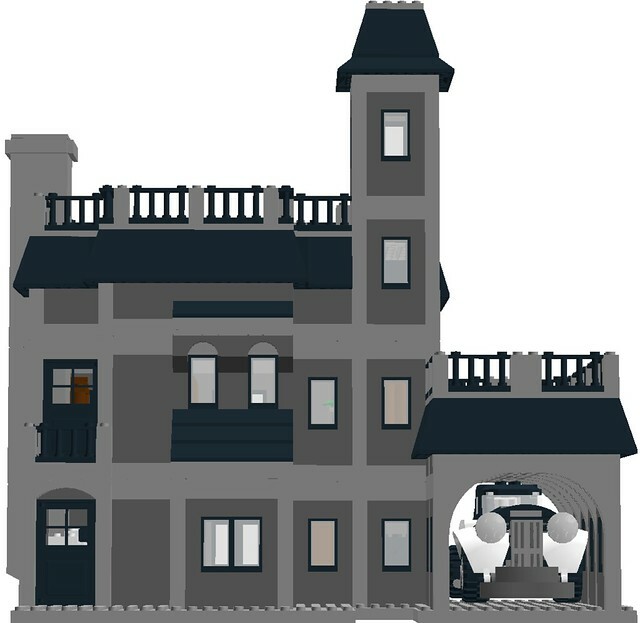 It was built by Lord Gregory Sinister for his family, and features one thing not usually seen on Victorian houses: a automobile garage (it was added later on in 1918 when Sam Sinister returned from the Great War.) The house was left to Gregory's family, (his son Sam Sinister & his sister Alexis Sinister) upon the elder Sinister's death of a stroke in 1913. Sam Sinister went on to serve in the British army in World War I, losing his left hand in the conflict and replacing it with a iron hook. When he returned from the conflict Sam set about continuing his fathers tradition: collecting treasures and precious artifacts, through legal and illegal means. 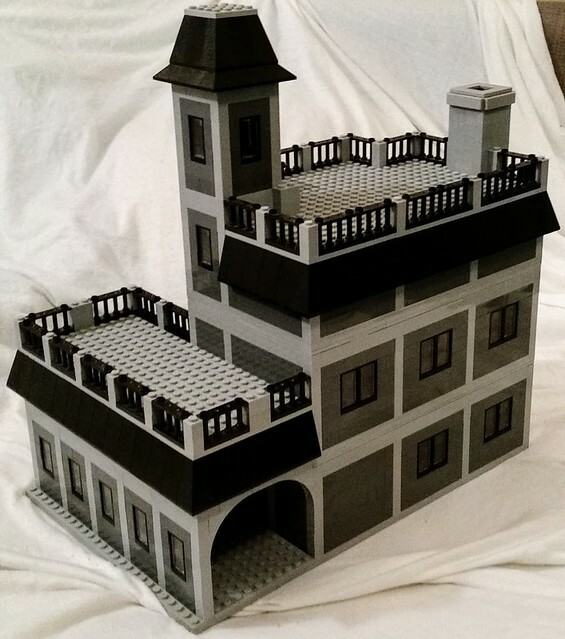 The collection was stored in the Attic of the sinister Mansion until it became too large and was moved to a more secure (and secret) location. Thoughts? Complaints? Questions? Feel free to post them! Main Post Edited 2/14/17: added new pictures of the building and the new car. LDD file for both car and house available here. Cool! I like all the rooms! It has some great potential. I think the façade needs a bit more texturing though. It is pretty flat, especially with that color scheme. Thanks, I was going for a late 1990's look, when the Adventurers theme started. I didn't want to use newer parts to make it rough looking, like the bare walls, missing windows, and crumbling stone in 10228. Besides, it is being lived in shortly (10 years or less) after being built, so it shouldn't have too much different from move-in day 1912.. right? I just want to say thanks to Action & Adventure moderator Peppermint_M for moving this thread to the Town Forum. I figured it might get to a wider audience since it is a building after all. I really like the car as well. I love the idea of Sam Sinister's Mansion and like your basic architectural style. I agree it could use more texture on the facade as is typical with older homes in this gothic style. Thanks for stopping by! I'm thinking about more architectural details, like something under the edge of the roof, but since it's not the same on each side, it may prove troublesome. (two sides of of the building have an 1 stud roof overhang, the other two do not so that the fencing on the roof keeps it's spacing.) 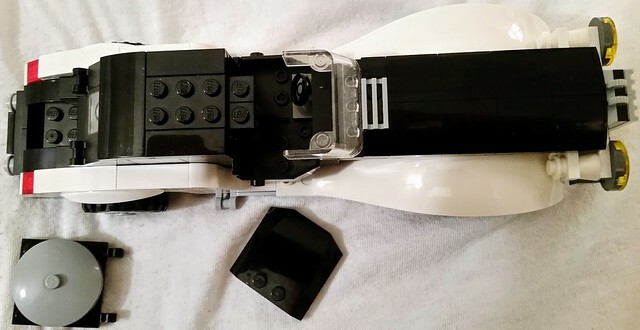 I'll see what I can do in LDD first before ordering bricks. I think the overall structure / shape of the building looks great, but I would also like to see some more textures in the walls. Love the pool table! That's a good idea, i'm thinking about bringing it to a Gateway LEGO Users Group (LUG) display in October at a 12 inch gauge steam railway. Thank you! I'm thinking about adding more details, but personally I think it looks good the way it is. Also, I think my brother designed that pool table. I bought it off him a while back and never had a place for it... until now. Main Post Edited: 7/10/16: Since the original pictures of this model are not my best, I've retaken them and added some new ones. I also restructured the writing. This Victorian model's garage isn't wide enough for the new 70911-style car to fit through, so I widened it and lengthened it to fit the elongated model. All in all, it should be done in real life by the middle of this month... newer pictures will follow when that happens. sorry for the bump, but this was just finished! 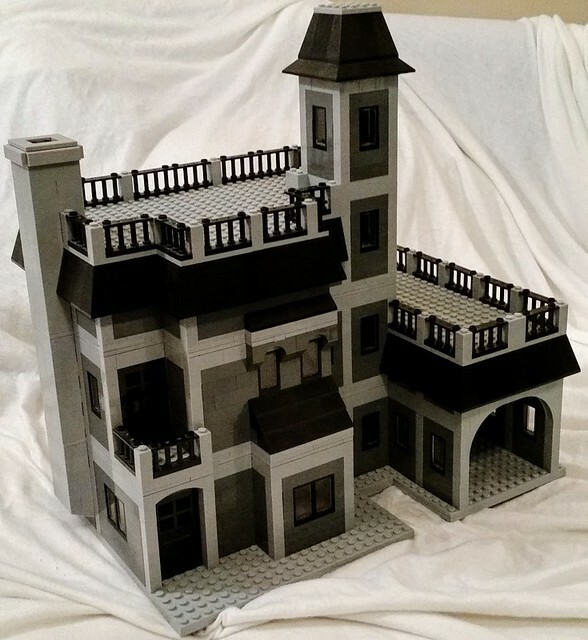 The updated LDD file for house and car has been uploaded, and the pictures for the house and car were refreshed to be current. Please see the first post for details.